Since January 2011 a band of 8 novice ringers, aged between 15 and 72 has been recruited. The 8 bells in the key of D which includes a pre-Reformation bell dated c.1480, hang in a wooden bell-frame which may well date from 1721 when the old ring of 5 was augmented to 8. Ringing practices are held at the church on Wednesdays between 5.30 and 7.00 pm. Practices on tied bells for beginners are held by arrangement with the Tower Captain. The ringing chamber is accessed by a stone staircase of 52 steps so reasonable fitness and mobility are needed. The band has made excellent progress and with the support of other ringers from the Hartismere Deanery rings regularly on the 1st and 3rd Sundays of the month at 10 am for the 10.45 am Sung Mass as well as for Weekday Evening Sung Masses held on notable Solemnities. Ringers are also available to ring for weddings and funerals and on Civic occasions. 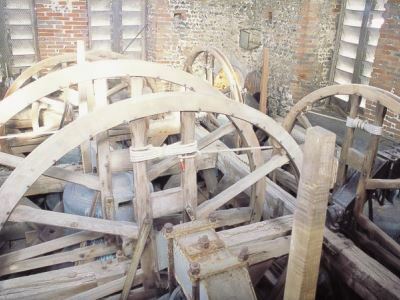 Ideally a ring of 8 bells needs 16 ringers in order that the bells may be rung regularly for services. New recruits from 12 to 70 years old are always welcome and are encouraged to attend advertised practices or email St John Perry stjan@echointernet.net or telephone 01379 870494. Be warned ringing is very addictive!